Locate Setup and identify its key elements. Identify important menus for customizing your org. Use Quick Find to access menu items. Earlier, we mentioned that you’ll spend a lot of time in Setup during your time as a Salesforce administrator. And we weren’t kidding. Setup is your one-stop-shop for customizing, configuring, and supporting your org. Since there’s so much you can do in the Setup area, it’s important to get comfortable with navigating it. There are a few ways to approach it. As you learn what’s available to you, you’ll get more comfortable finding the things you need. 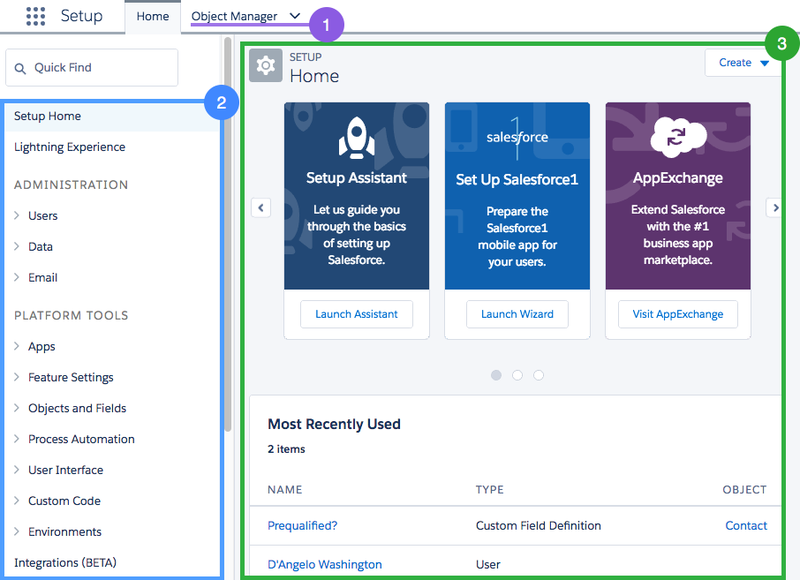 You can get to Setup from any page in your Salesforce org. From the gear menu at the top of the screen ( ), click Setup. Let’s get familiar with the Setup area. Object Manager: Object Manager is where you can view and customize standard and custom objects in your org. Setup Menu: The menu gives you quick links to a collection of pages that let you do everything from managing your users to modifying security settings. Main Window: We’re showing you the Setup home page, but this is where you can see whatever it is you’re trying to work on. The Setup Menu is the trickiest piece to navigate because there are so many different pages you can access. There are two ways to get where you want to go. If you already have an idea where to look, expand the appropriate menu and select the page you want. If you aren’t sure where to look, use the Quick Find box to search. Lets say you wanted to manage your user permission sets. If you happen to know that permission sets are in the Users menu under Administration, just open that menu and click Permission Sets. Otherwise enter Permission Sets in the Quick Find box. There are three main categories in the Setup menu: Administration, Platform Tools, and Settings. Let’s take a look at what’s available. Administration: The Administration category is where you manage your users and data. You can do things like add users, change permissions, import and export data, and create email templates. Platform Tools: You do most of your customization in Platform Tools. You can view and manage your data model, create apps, modify the user interface, and deploy new features to your users. If you decide to try your hand at programmatic development, Platform Tools is where you manage your code as well. Settings: Finally, Settings is where you manage your company information and org security. You can do things like add business hours, change your locale, and view your org’s history. Of course, these are only some of the pages you can access in the Setup menu. To get you started on the right foot, here’s a list of our top five Setup pages to know about.